Thanks to a certain French endurance race, this weekend’s Tudor USCC race will be the first time in nearly two months that all four classes have been on track at the same time but, with the legendary Watkins Glen as the venue, and six hours of racing to be completed, the wait has been worth it. Since securing season-opening victories at Daytona and Sebring, the fortunes of the works Porsche North America Racing squad have hung firmly in the ‘mixed’ category so far in their GTLM title quest. Last time out at Laguna Seca, the no.911 Porsche 911 RSR of Nick Tandy and Jörg Bergmeister lost a podium finish after stewards adjudged the Briton’s driving in the final stages to be too rough (although the BMW he was racing at the time went unpenalised despite similar tough manoeuvres). The no. 912 Porsche 911 RSR leads the way for PNAR, with Michael Christensen and Patrick Long lying third in the standings. Watkins Glen’s high-speed sweeps are unlikely to suit the 2014-spec 911 RSR in the same way that it will the Corvette C7.R, and the lack of traction-dependent, slow-speed corners again does not play into the Porsche’s forte. However, where Porsche North America Racing will revel is in the length of the race. At six hours long, Watkins Glen marks the third of the 2014 season’s four ‘North American Endurance Cup’ events, of which Daytona and Sebring were the first two. The factory team has regularly shown its excellent pit and teamwork during the early part of this new US campaign, while the 991 RSR is more at home in the longer distance races (again evidenced with a third place for Tandy’s no.91 partner, Richard Lietz at Le Mans two weeks ago). Team Falken undertake their second endurance race with the only customer 991 RSR in the USA. Corvette were also strong at La Sarthe (while the championship-leading BMW outfit did not travel to France but will still be in the mix) however, a good result for both the no. 911 and the no. 912 Porsches will vault the Weissach duo right back into the title hunt. In the slower but no less spectacular GTD class, Porsche is right at the sharp end despite the plethora of competing manufacturers. The no. 22 Alex Job Racing 911 GT America sits second in the standings thanks to drivers, Cooper MacNeil and Leh Keen, who will be joined by Swiss pro, Philipp Frommenwiler this weekend. The no. 44 Magnus Racing 911 GT America enters Watkins Glen third in the standings, five points off the class-leading Ferrari 458 and just three points further back from the aforementioned Alex Job entry. 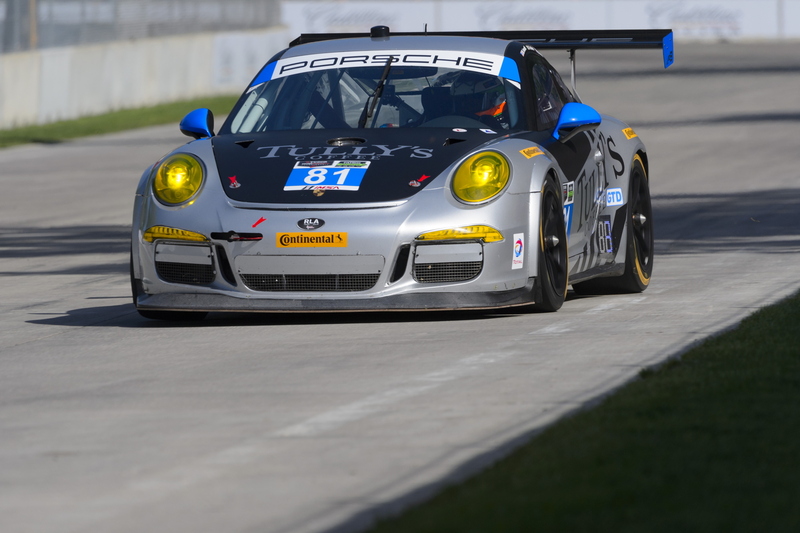 Ben Barker has been called up to drive the Tully’s Coffee-sponsored 911 GT America after an impressive debut in Detroit. As well as Nick Tandy, Total 911 will once again have another of its racing columnists to cheer on at Watkins Glen after Supercup frontrunner, Ben Barker has been called up to partner Damien Faulkner and Michael Avenatti in the no. 81 Tully’s Coffee GB Autosport Porsche. Barker put in an impressive showing for the team in his US debut last time out in Detroit and his services have been called upon again after the squad decided to run a third driver for the six-hour race around the New York State circuit. Action on the 3.4-mile track gets underway on Friday before GTD and GTLM qualifying takes place at 3:55pm and 4:15pm ET respectively on Saturday. The race itself is green flagged at 11:10am ET on Sunday with our comprehensive race report to look out for on Monday morning. Alex Job Racing leads the Weissach charge in the GTD class.